I have a feeling this is going to be one looooong post so you might want to grab a little snack or a hot beverage before you read. My mantel was a real challenge to decorate this year. Let's spell out some of those challenges, shall we? First: the walls of my living room are no longer orange. Second: the fireplaced wall no longer sports dark paneling. Third: the giant 6 foot by 4 foot mirror from the 1940s no longer hangs on the wall above the mantel. Fourth: my ceilings are 9 feet high and there's just a whole lotta wall to deal with along with the mantel. Fifth: I decided not to display my Christmas village on the mantel this year as I have in years past. Sixth: My mantel is huge. 6 feet long, but it's the depth that's the killer...just over 17 inches deep. I can't tell you the photos I looked at & the trips to stores that I took just to get ideas. I have spent so much time in Hobby Lobby I'm now embarrassed when I see the store manager. I just know he's thinking, "she can't possibly be in here again!" I just know he's thinking that. Anyway, I changed my game plan more times than I would care to count. While out searching for ideas for the 800th time, I came across something in TJ Maxx that stopped me in my tracks...a giant canvas candy cane. I studied it for some time, but I didn't think it was large enough for the monster wall. I thought of buying two candy canes & criss crossing them, however, they were not oriented in opposite directions to criss cross. Why couldn't I "frame" the candy cane? I bought it, went back to Hobby Lobby & bought a frame. With a little help from my hubby, I had the perfect wall filler. Now what to do with the mantel? Why not play out this whole striped, candy cane, red, white & green thing? I then enlisted the help of every glass vessel in the house (not to mention another trip or 2 to Hobby Lobby). I filled all the jars with striped candy & colorful Christmas balls in my red, white & green color scheme. So here she is in all her striped, candy cane, red, white & green glory. Considering the challenges, I don't think she looks half bad. Now truth be told, I really, really, really wanted to change out the stockings for something that was complimentary to my whole candy cane theme. Believe me when I tell you, the mere suggestion of it brought about a rebellion in my house...children revolting...how dare I...they are the stockings we've had our whole lives...hubby scowling in disgust...it was getting ugly, I tell ya. Oh the anger towards me for even thinking it! I'll be back soon with more Chrismas decor photos. Have a good one! Also, I would like to link this at Marty's blog A Stroll Thru Life. 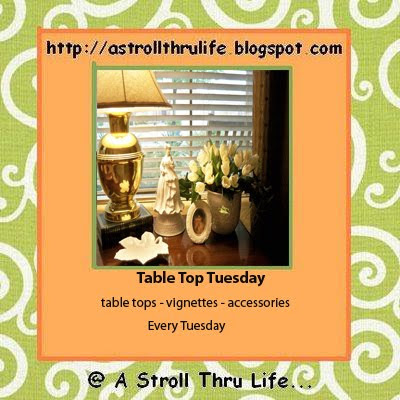 Do you think a mantel can qualify as a table top vignette for Table Top Tuesday? I hope it's ok with Marty. LOL! !~ I can hear the roars from here! 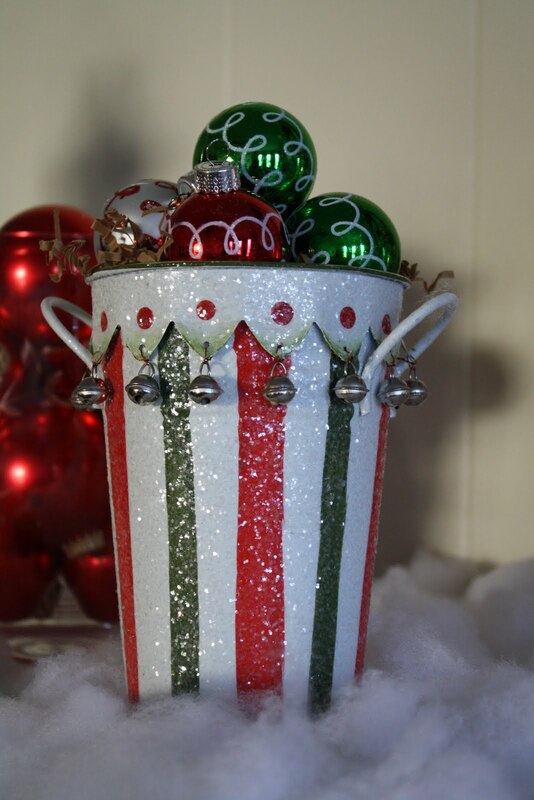 Looks great Gina, I love the frame..I did that in my kitchen and I change it out seasonally. Your FP is looking fantastic! I think your mantel looks great!! Looks like all of your hard work paid off. I don't know what it is, but I really struggle. I am jealous! I want a christmas candy themed mantel! Heck, at this point, I'd settle for a mantel! lol. I think it is absolutely beautiful! I love it!! I just love the candy cane framed! 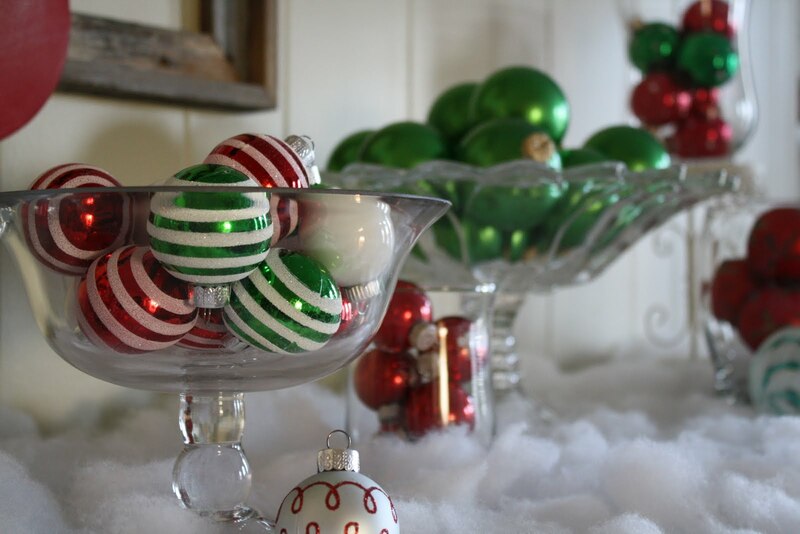 The mantel is great with candy and balls! 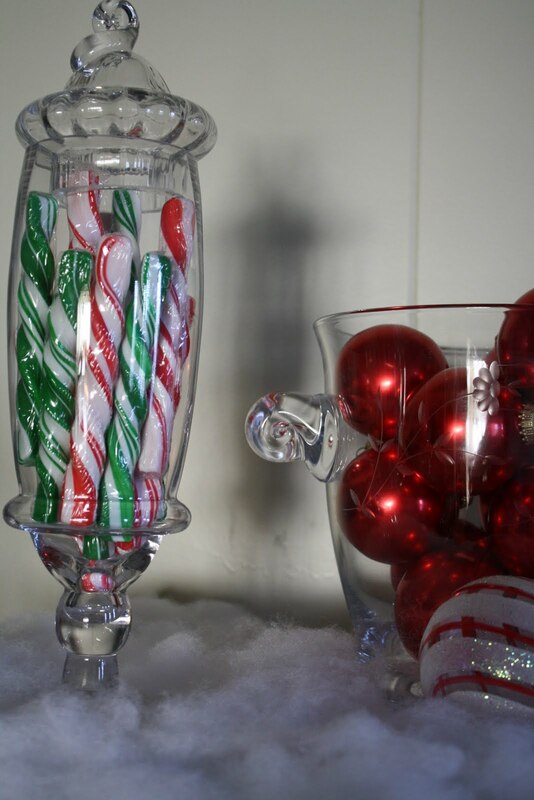 But adore the candy cane! I just love the candy theme!! Everything looks great! You did an awesome job! That's adorable. How dare you try to change out the stockings? For my son's 1st Christmas I just ran to the store and bought the 1st stocking I saw. Now I'm stuck with that ugly thing because it's HIS. If I had only known it was going to be such a big deal I would have chosen more carefully. Your mantel turned out great Gina! I can totally relate on the changing the stockings thing. I handpainted each of ours when the kids were born and now I am no longer in love with them and want to change them but the kids look at me like I have 3 heads and start yelling "no!" I guess I should be flattered but I really want to change them out for something more our style. Anyway...thanks for sharing these pics. Perfect, perfect, perfect. 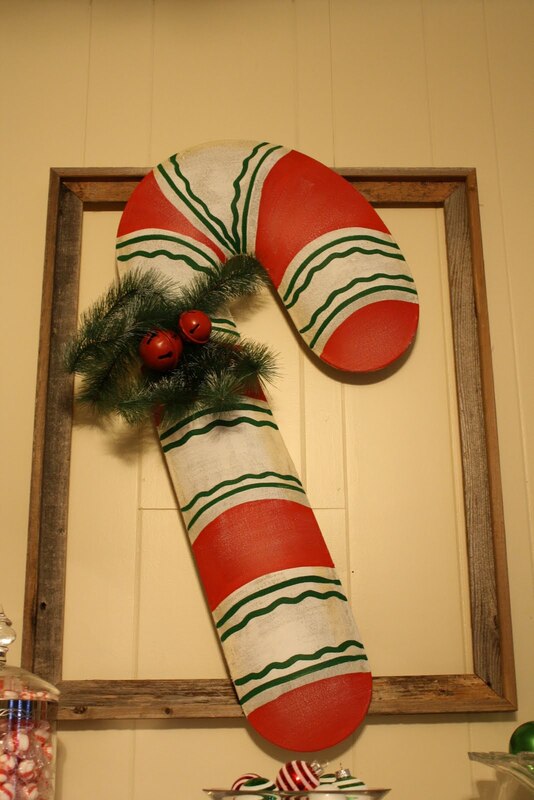 The big candy cane looks awesome and your mantel turned out beautiful and very festive. I love it Gina! Can't wait to see more. Have a wonderful evening my dear friend. 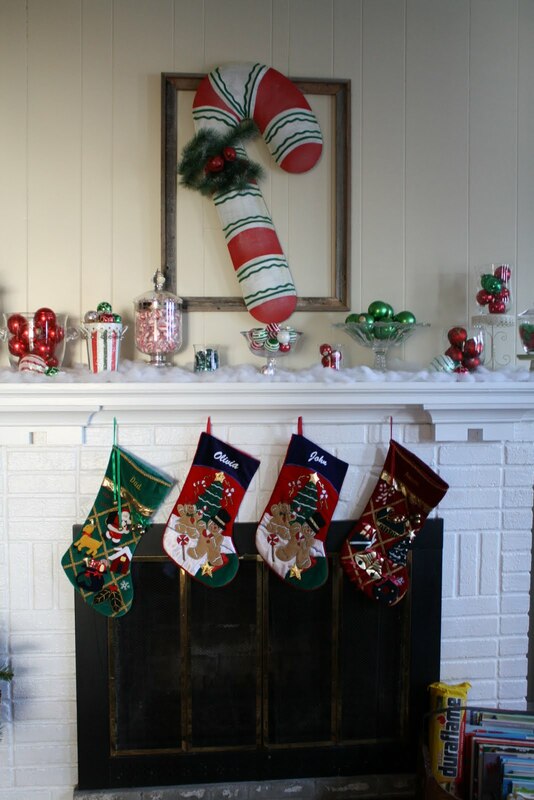 Oh I love your mantel...so fun and festive! Thanks for sharing with all of us.